Dr. Rick Ideta specializes in General Optometry, contact lenses, children’s vision, vision therapy and sports vision. He earned his Optometric Degree from Pacific University College of Optometry in 1986. After 10 years in solo private practice, Dr. Ideta formed a partnership with Dr. Gary Mukai in 1996 under the group name East Shaw Optometric Group. 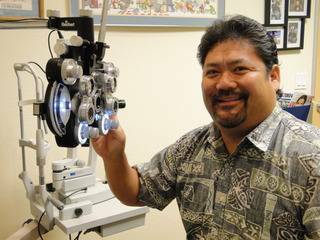 In March, 2010, the partnership of Dr. Ideta and Dr. Mukai moved to its present location of 7215 N. First Street under the new name of Aloha Family Optometric Group. Dr. Ideta is an active member of the American Optometric Association (AOA), California Optometric Association (COA), Central California Optometric Society (CCOS), Optometric Extension program (OEP) and the College of Vision Development (COVD). He has served as a board member of the local Optometric society for over 20 years. Dr. Ideta has also served as President of the CCOS and was awarded “Optometrist of the Year” in 1997. He received the “Young Optometrist of the Year” award on the state level from COA in 1992. He has worked directly with the Community Outpatient Rehabilitation Center in Fresno along with the Kaweah Delta Rehabilitation Hospital with Stroke and Traumatic Brain Injury patients and has given numerous lectures at hospitals, rehabilitation centers in Fresno and Fresno State University on TBI’s. Dr. Ideta also specializes in Vision Therapy, where he enjoys working with children and adults with visual problems such as turned eyes and learning disabilities. Vision Therapy is a program designed to correct and enhance weak or improper vision functions. Vision therapy is not used simply to strengthen eye muscles, but rather to treat functional visual conditions in order to improve the efficiency and comfort of your visual skills. Dr. Ideta was born in Fowler and graduated from Fresno State University with a degree in Biology. He met his wife, Stacy, in Optometry school and is celebrating their 27th anniversary this October. She is also an optometrist here in the Valley. Dr. Ideta has two sons. Trevor is currently in his 4th year of medical school at the John A. Burns Medical School in Honolulu, Hawaii and interested in the field of Anesthesiology. Gaven is currently attending California State University, Los Angeles and majoring in Chemistry to pursue a career in Forensics. In his spare time, Dr. Ideta is involved in his local church and is still getting out to as many San Francisco Giants baseball games as possible!